We are pretty stoked about our e-liquid offerings, and it’s not a matter of tooting our own horn! We love a good, clean vapor that hits smooth, packs a big punch of a throat hit, and is loaded with flavor, regardless of which flavor or flavors we happen to choose on any particular day… don’t you? In this light, we are proud to offer you what we consider to be the best e-liquids available, and we are especially pleased with the incredible selection that has come from our custom blending. Being able to offer more than 30,000 different flavor options is no small feat! Our customers are thrilled with the possibilities, and so are we, because we know how important it is to be able to please everybody, and it goes without saying, even the pickiest of e-smokers can find a few flavors and/ or blends they like! Here is a look at some of our e-liquid top blends, and how they may appeal to you if you’re looking but can’t decide. Mango Cheesecake: Mango cheesecake, better than strawberry or cherry because it’s SO decadent! Juicy Fruit: Strawberry and watermelon; it can’t get juicier! 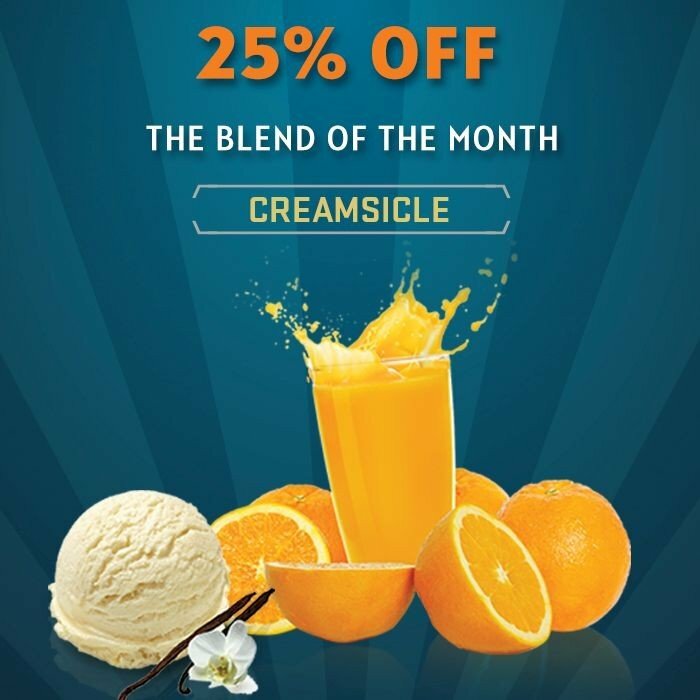 Creamsicle: A classic treat that won’t drip down your chin, oranges and cream go together deliciously! Tobaccolicious: Rich tobacco mellowed out with vanilla and caramel! Fruity Hookah: Grape and watermelon combined with Shisha tobacco make an incredible combo! Crazy Cuban: The indelible flavors of Cuba, the Cuban cigar and bananas come together exquisitely here! Watermelon Chill: Watermelon takes on a cooler note when blended with Cool Menthol. Cool Citrus: When you want refreshing vapor that cools you down, this is it. Creamy Menthol Latte: Rich espresso, menthol, and crème create a ridiculously luscious flavor! Mint Julep: Southern minty comfort, and so refreshing! Chocojava: The iconic mocha, none of the calories, and indulgence whenever you crave it! Frozen Banana: Bananas and chocolate, need we say more? So, Is your mouth watering yet? Our suggestion if you’re stuck and can’t choose just one for e-smoking? Go big, grab a few blends because “less is more” does not apply here! What to Choose? E-Cigarettes, Disposable E-Cigs, or Vaping Pen?